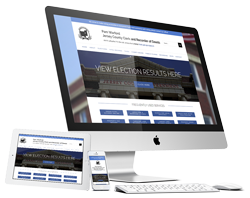 Jersey County Clerk wanted to update their website to a mobile friendly and more visual platform that showed their visitors what they can really do for the public. Their old website was failing to communicate the different type of information on the website. They also wanted an easy way for publishing general interest announcements. We created a WordPress responsive website for this government website. It is instantly more appealing and features images of actual Jersey County Clerk staff members to demonstrate their credibility and professionalism. In addition, we rebranded their website from an “old-fashioned, 90’s” government website to a modern platform. Visitors can browse the website on any device – PC, tablet or smartphone. A completely new site that appeals to visitors and has all the information needed at hand.